I missed tour due to chronic illness flare up but was refunded my ticket. I’m so disappointed that I missed it as my family still went and had a fantastic time. My husband and daughter said that the driver was funny and informative and the sightseeing was excellent! Favorite things for my family were driving down Lombard street and seeing the “Full House” house. Great tour good to do when you first get to the city as gives you bearings so you know where you want to go back to. Also lots of fun! The tour was great. Tyler was extremely knowledgeable and took us places that we never would have seen on our own! Jet was fun and friendly. Cool ride felt like celebrities. Great way to learn about the city. Feeling San Fran love. Though the weather was not cooperative (drizzling and cloudy 90% of the time), my friend and I enjoyed it as we had very good insider information of places within SF which we may have not known if we didn't take the tour. Our guide (his name escapes me, so sorry, it it helps we were the only van on March 3, 11am, who had only 4 people in it) was very engaging, attentive of our questions, and was a joy to be with. He was thoughtful of us - if we were feeling okay with the temperature so he'd close the windows, if we needed to go to the loo, if we had questions. He also appreciated our thoughts and insights which made the tour engaging and not just one-way. Definitely recommending this when you only have a short break to tour the city! We had a great time and couldn't believe how many sites we were able to see on our tour. Tyler was awesome at pointing out the city's history and major landmarks to us along the way, stopping for several fantastic photo ops. My wife and 2 daughters (17 and 7 y.o.) thoroughly enjoyed. We highly recommend! Alfred was a terrific tour guide! Great personality, great history and information, and wonderful way to get to experience San Francisco. Groovy!!! Unique tour, very informative, would do it again! 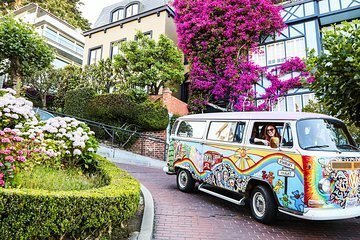 Experience San Francisco in a different way! Recommend to all! Even though it was a raining day we had a great and fun time with the driver. He was very knowledgeable and entertaining.